One of the principles of ‘mythogeography’ is to embrace both ‘respectable’ (academic, scientific, ‘culturally validated’) and ‘non-respectable’ (fortean-anomalistic, antiquarian, pseudo-scientific, mystical and fictional) knowledges, judging them first against their own criteria and then setting the different knowledges in orbit about each other, seeking to intuit their gravitational pulls upon each other. The rewards can be many and they can be deep ones, but, equally, there are frustrations. Recent trawls through the oceans of esoteric literature have left this exploratory and predatory reader more incandescent than illuminated; presenting a minor swerve on a conventional path as a grand journey of imagination or psyche being the most common and infuriating trait. 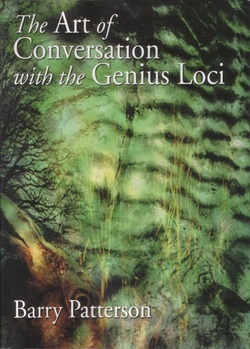 Barry Patterson’s The Art of Conversation with the Genius Loci has, then, come as something of a relief. At least his contradictions – being both ‘in the moment’ and intuiting ‘timelessness’, acknowledging his anthropomorphism and then ploughing on to animism – are engaging. He may construct a travesty of mechanistic science against which to set a laughing gull, but he has the grace to acknowledge that his, like any other reality, “depends on the story which we constantly tell ourselves about our lives”. Patterson is driven to escape the industrial and urban and yet prepared to see the botany along the asphalt. He is quiet – letting the Genius Loci speak to him rather than badger it (or us) with his own certainty. There is a disarming gentleness here. The author understands that the mystical makes its own misdirections: “our hopes and dreams fail to appear... so we visualise the other place, the other time, in which we fulfil our program. We locate authority, power and the sacred elsewhere”. So Patterson has a commitment to the ‘here’ of Loci, its Genius present rather than abstracted, elevated or dislocated; his methods are as much sensual as esoteric. Frustratingly, because there is enough honesty here to trust his assessments, Patterson is light on the details of technique: listening to places and beasts, talking to a hill, waiting for intuitions of ‘atmosphere’, looking, feeling, touching, smelling, studying books on birds and trees, wandering aimlessly, tracing faults, layers and anomalies in the geology, behaving as a guest, waiting for a guide and following it when it comes, looking for patterns, asking the Genius to tell a story, leaving modest offerings, pretending, going into a trance, invocation. There’s much here that anyone can draw on for their explorations and Patterson’s effortless slipping from the everyday to the magical is charming, but for the uninitiated some detailed practical guidance would have been welcome. Where he is detailed and practical, as in his instructions for a visit to Mythago Wood, Patterson’s technique is imaginative and sound: not going in at first, exploring the perimeter, using the portals as windows, and so on. Patterson is open about the ambiguities of magic and aware of the dangers of getting “[C]aught up in our own particular brand of Keltic Twilight Romanticism”, but nevertheless, common to much ‘pagan’ (I know, I know) commentary, there hangs around ‘Conversations’ a sense, intended or not, of a singularity descending, an encompassment by an unorthodox orthodoxy of holism and nostalgia. Often he breaks from this towards multiplicity – “[T]he huge tentacled horror which has slept beneath my house for millennia may well be a fossilised cephalopod” – but for us an acid test came when Patterson addresses Canley Ford in Coventry; to Patterson, fairly recently moved to Coventry this is a green “beauty spot” within the city to be preserved from urban encroachment and yet for me, growing up in the city, Canley Ford perversely represented modernity. I distinctly remember (which is about as unreliable as it gets) a Sunday afternoon visit to the Ford around 1963, the sun shone, someone had parked up a huge pink Cadillac and I drank cold milk from a dispensing machine (this was before we had a fridge at home and such a machine chill was as unfamiliar as an American car). To me the Genius Loci of Canley Ford may be different to the one Patterson addresses in ‘Conversations’, but perhaps more importantly, he makes me want to go and talk with it and listen to it again. Appropriately, he ends the book with some sound observations on the Art of Memory.